Empower yourself, make your own chemical free products. Learn how to be healthy and make your home healthy and chemical-free. Everyone loves when their clothes smell nice. 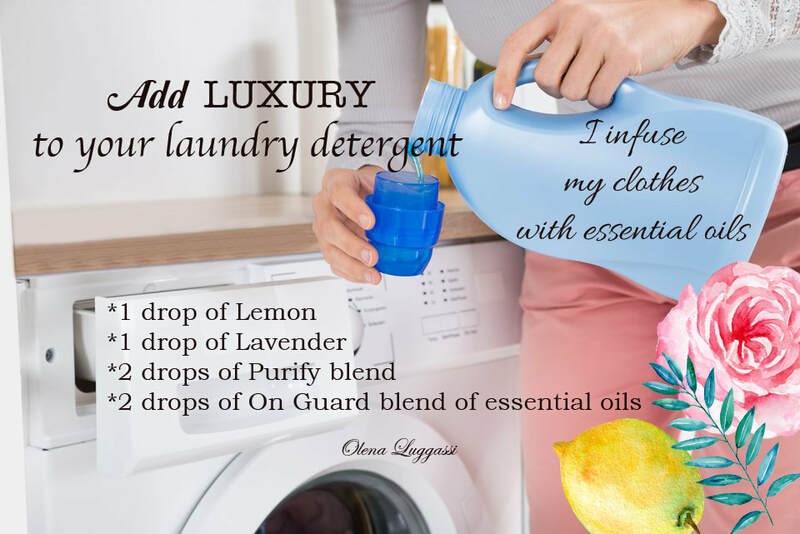 I love it so much that I started adding some LUXURY to my laundry detergent-a few drops of flower essential oils. I started adding doTERRA essential oils to every single wash and I LOVE the way my clothes smell, and my house also! Adding Lemon makes your clothes smell fresh and clean. doTERRA blends On Guard and Purify consist of some powerful cleaning and anti-bacterial essential oils. For example, On Guard's ingredients are Wild Orange Peel, Clove Bud, Cinnamon Leaf, Cinnamon Bark, Eucalyptus Leaf, and Rosemary Leaf/Flower essential oils. Experiment with essential oils to find your favourites. Don’t be afraid to combine different oils to create a custom scent. Purify cleans everything in your house, you can add a few drops to your dishwasher and laundry. The blend contains Lemon Peel, Siberian Fir Needle, Citronella Grass, Lime Peel, Melaleuca (Tea Tree) Leaf, Cilantro Herb essential oils. Forget the toxic chemicals of traditional cleansers and create your own cleansing spray with Purify. For a natural and effective household cleaner, simply add five drops of Purify essential oil blend into a small spray bottle filled with water and vinegar. This minimalistic combination is perfect for wiping down countertops while leaving a fresh scent in its wake. It’s a fact that some odors linger a little bit longer than others—especially when clothes are concerned. Sometime putting your smelly clothes into the laundry doesn’t always translate into stench-free clothing coming out. For clothes that come out smelling as clean as they look, add a few drops of Purify essential oil into the rinse cycle when doing laundry. Purify will help eliminate tough odors. Is your stove top caked with difficult liquid stains and charred food? Turn that kitchen eye sore into a shiny appliance with this DIY Stove Top Cleaner recipe including Purify essential oil. This easy recipe will help clean off grime and leave the stove’s surface looking clean and sparkly. To give a fresh, herbal aroma to small rooms, place a few drops of Purify essential oil blend onto a cotton ball and put it into the air vent in the room. When the air blows through the vent, it will waft in the refreshing scents of Purify—giving the room a continual burst of clean and fresh air. On Guard is an immune boosting blend but it also a powerful cleaning blend! It contains: Wild Orange Peel, Clove Bud, Cinnamon Bark, Eucalyptus Leaf, Rosemary Leaf/Flower. 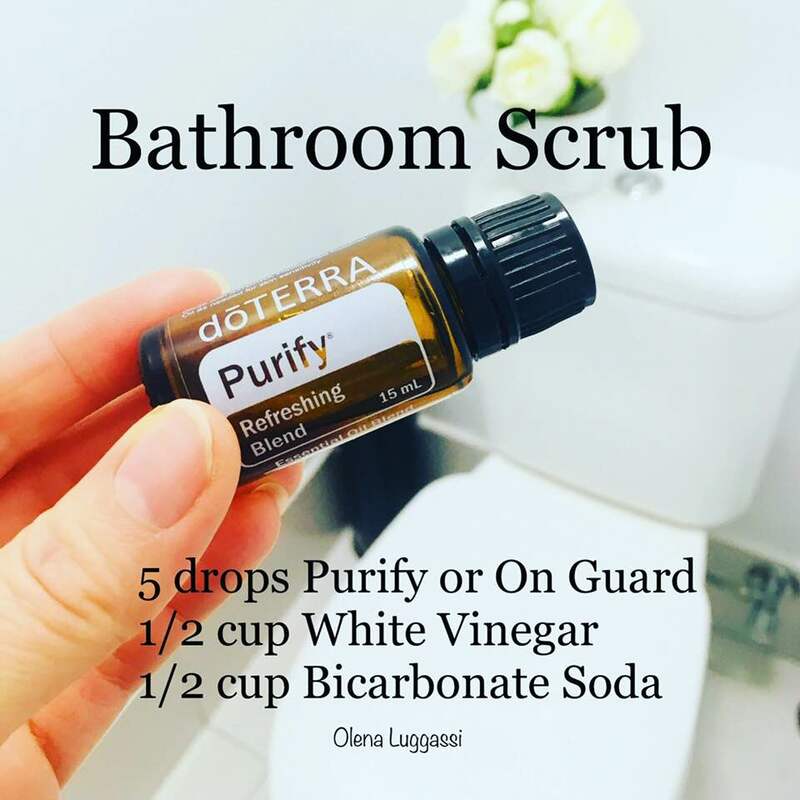 For a natural and nontoxic cleaner, add a couple drops of doTERRA On Guard essential oil to a spray bottle filled with water and use it as an effective all-purpose surface cleaner. With its unique aroma, doTERRA On Guard offers a fragrant, natural, way to clean. The most general thing to do for any bug problem is to keep the garden area clean and free from debris and hiding places for pests. Peppermint, Clove, Cedarwood, Geranium, Lemongrass, Rosemary, or Arborvitae essential oils also repel bugs naturally. Put 10 drops of any of these oils in a spray bottle with water (preferably when the weather is not very hot) and spray the areas of concern. Aphids. Use a neem oil based spray. This natural method is easy on plants, but gets rid of the aphids. Aphids can also be controlled to a certain extent by planting some “trap crops” like alyssum, dill, and yarrow around the garden that attracts the aphids instead. Squash bugs. Squash bugs can survive cold winters and hide almost anywhere. Check for eggs on the underside of the leaves of the plants (they are usually orange in colour) and squish them before they hatch. Spider mites. They love dry areas and dust. Try to control by misting the plants–water bothers them.